Additionally, the pergolas we offer are versatile, as we offer a number of different styles to choose from. For example, we offer attached, free-standing, and garden arbor designs. 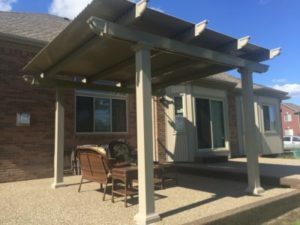 We also sell operable pergolas, which provide the best of both worlds by allowing the structure to fully close like a patio cover and open to let warm sunshine filter into the space. Here at AAA Window – Siding Roofing, we not only offer some of the best pergolas on the market, we also provide professional installation services. Our skilled team of highly experienced installers will ensure your pergola is installed properly and promptly so you can begin enjoying your new home upgrade as quickly as possible. Furthermore, we’ll back our labor with a lifetime service warranty for added peace of mind. To learn more about the stylish pergolas we offer to homeowners in the Lincoln, IL, area, contact AAA Window – Siding Roofing today. One of our knowledgeable and friendly associates will be happy to answer any questions you have and get you well on your way to enjoying the upgraded outdoor living area you’ve always wanted.